Bella Viva Orchards carries out with pride. 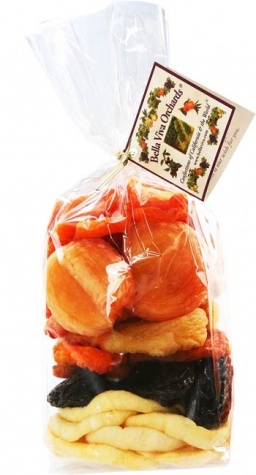 They produce and sell fresh and dried fruit, nuts and chocolate to their local customers at their stands in northern California's celebrated farmer's markets, in select restaurants and online across the country.Named after their daughters, Vivian and Belle, Bella Viva means beautiful long life in Italian. The name captures the essence of Bella Viva Orchards. I had the opportunity to try Bella Viva Orchards mixed dried fruit. I honestly really loved it, as did my husband, more so then I. This is such a great snack to have and it’s a much healthier choice, especially if you’re trying to eat healthy or loose weight. I found that the fruit was very fresh tasting and very delightful. The package was a nice variety of fruits, which included apples, apricots, berries and more. I would definitely try them again.